Yay, I get my own avatar now! Is it shallow to pick the hottest guy there? Why on Earth would anyone ever think the fiction editor controls the art? Also, well, just LOL. Get promoted from letter-opener to picture-peeper and one’s self-importance ZOOMs. Nick, Doug Cohen is now listed on the masthead as Non-Fiction Editor and Art Director. The Art Director generally does control the art, at least in all the magazines I’ve ever worked for, and I suspect in the ones you’ve worked for as well. Oh, I get your point now–Doug’s whole “WELL SHAWNA LIKED IT AND SHE’S A GIRL” was a stupid deflection, since he’s the Art Director. God bless. That is all. Got here via Tempest’s blog. OMG. Totally hot. Yay! Oooh! Oooh! Want for avatar, totally! I too had been wondering if there would be any substantive and useful changes at RoF on that front so I guess that answers that question. Heh. I am biting my tongue on the snark, esp. as I actually have a professional magazine background and all. The textured weave adds a whole other level of brilliant. Hallelujah! Praise . . . whatever! Tempest, I have no problem with the image and wouldn’t bounce it if an Art Director brought it to me. But I have to admit that the cover text bums me out. I thought we were having a valuable conversation here and now I discover you’re just mocking and belittling us. I will point out that I did not actually make the cover design above. That was provided in the previous thread by commenter Charlotte. The cover text is, I believe, in response to the text on the current RoF cover and the stuff I posted. You’ll have to ask her why she felt the need to be extreme with the mocking. But, if you want my honest critique of the cover (beyond the image and that font… please no more with that font), I would have to say the “HARRY POTTER” seemed particularly non-sequitorious given there’s no context, and I’m not the first to say that. I haven’t looked at your other comments yet (I’m about to get on the train, I’ll un-moderate them now, tho), but if you’re not aware of the issues that I presented with an air of snark and would like me to take them on and discuss them with you sans-snark, I’m happy to. The cover titles weren’t really meant to mock anything other than what might be considered “good names, etc.” to put on a fantasy cover in order to sell it. 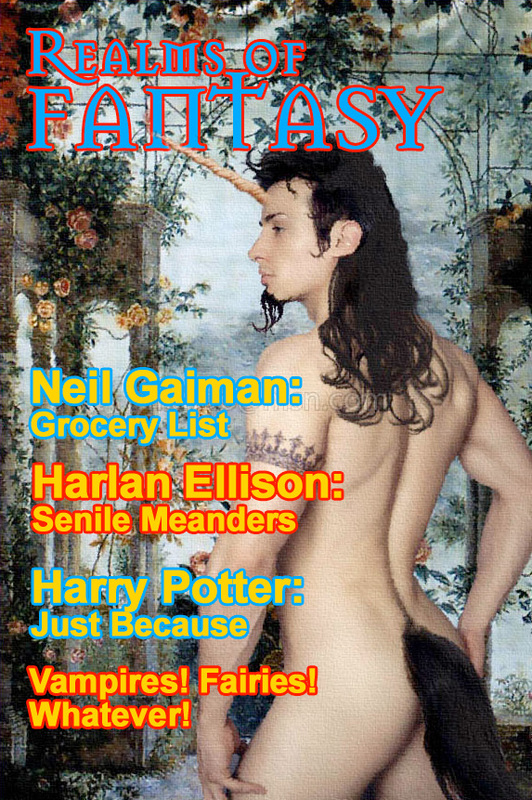 Just about anything penned by Neil Gaiman — including his grocery list — would be “hot.” Harlan, God bless and preserve him, is often considered a name writer, although fewer and fewer fantasy readers recognize it and, let’s face it, Harlan is not writing at his prime now. As for Harry Potter, vampires and fairies, that’s the stereotypical content. This is so wonderful! I love it. So racism and sexism are, quite rightly, to be condemned, but agism and mocking those who suffer from dementia is OK? Jim, see the first post I made on Harlan Ellison. Should still be on the sidebar. I did read the posting on Mr. Ellison and the various comments. I realise that the ROF cover was a mock up. But the reference to Mr. Ellison on the front makes fun of his age and treats Senile Dementia ( a vile and dreadful condition) as a source of amusement. I find it sad that many who quite rightly struggle against the evils of racism and sexism should find amusement in mocking others because of their age or making light of an illness such as Dementia. Harlan’s commentary and the legal enthusiasm with which he sometimes in some peoples view anachronistically engages and disengages in conversations plus the the fact he is a GoM of SF give rise to a throwaway comment. He’s good guy but also reputed to be somewhat sometimes prickly, like a lot of people’s grandpas. hell, I am too. A guy who can sed himself up as a cranky PITA of a computer has a sense of humour and self-deprecation. He might enjoy the cover, I have no idea. sure it’s a non-PC comment and nobody concerned would no regard senility or the demographic age-bomb about to hit the planet as anything other than serious. black humour and satire are nonetheless valid devices for comment. its was played for laughs and the rest is the reader’s problem, bad taste like any other comment is not generally subject to legal sanction. public disapprobation is another thing. it? edgy, but humour and satire and have been and are used used as weapons when ageism and sexism do become evils. its valid comment even if you happen to disagree with it. Crusaders without a sense of humour don’t last long. I am just pointing out that to denigrate a person on the basis of their date of birth is just as wrong as it would be to do so on the basis of their oolour or gender. And to express my surprise that those who would rightly never mock a person in a wheelchair have no problem making fun of those who suffer from senile dementia. Might I suggest that there is a certain double standard in play here. Perhaps the problem is that in the eyes of many those of a certain age have beome the ‘other’ and thus can be treated as something less than human.